Welcome to cover the 16th announcement of the Astrid Lindgren Memorial Award (ALMA), the world’s largest award for children’s and young adult literature.The Swedish award amounts to approx.EUR 570 000 and is presented annually to a single recipient or to several. Tuesday March 27 at 12:45pm CEST, Bio Victor/ Filmhuset, Borgvägen 1-4 in Stockholm. 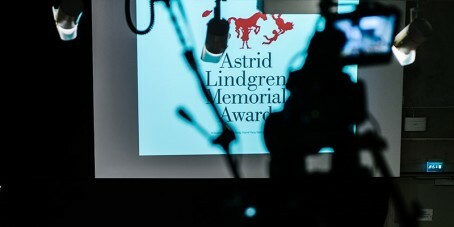 The 2018 Astrid Lindgren Memorial Award (ALMA) Laureate will be announced in Stockholm, Sweden on March 27 by Jury Chairman Boel Westin in connection with the jury’s final meeting. Opening speakers are Ulrika Stuart Hamilton, Chair at the Swedish Arts Council, and Alice Bah Kuhnke, Swedish Minister for Culture and Democracy. The announcemnet will be followed by a presentation of the laureate by jury member Katarina Kieri. Last year’s laureate was the German illustrator Wolf Erlbruch. Previous laureates include Meg Rosoff (2016), Philip Pullman (2005), Kitty Crowther (2010), Barbro Lindgren (2014) and Shaun Tan (2011). For this year’s award, 235 candidates from 60 countries are nominated. The list of candidates is available here. This entry was posted on March 26, 2018 at 6:11 am and is filed under Uncategorized. You can follow any responses to this entry through the RSS 2.0 feed. You can leave a response, or trackback from your own site.